Quik Smog in Mountain View, CA is STAR Certified Smog Check Station proudly serving Bay Area since 2003 - the oldest station in the area! Quik Smog inspects and certifies nearly all vehicles, including Gross Polluters! 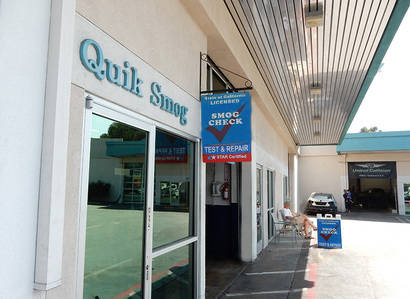 Quik Smog was founded by Jeremy Jain, an environmentalist and an entrepreneur with the vision to provide honest, low cost, fast and friendly smog check services to the bay area community. In 2003, after realizing the need for improving the air quality in California, known to be worst in the nation, Jain, decided to start Quik Smog. Since its inception in 2003, Quick Smog has repeatedly served customers every year for all their smog check and car care needs. Quik Smog has consistently been appreciated by customers for honesty and super customer service- quickest and friendliest of them all! Licensed by the Bureau of Automotive Repair (BAR) as a STAR certified smog check station, Quik Smog provides smog check and repair services in a clean and friendly environment. Our smog technicians are well trained, quick and committed to make your whole experience enjoyable and effortless. Our average smog check wait times are between 15-20 minutes. A Vehicle Inspection Report (VIR) is provided with the completion of your smog check and also transmitted to the DMV for your vehicle records. Once your vehicle passes, Quik Smog's system will automatically transmit your Smog Certificate to the DMV electronically, saving you time! Quik Smog's goal is to quickly inspect and certify your vehicle while you enjoy complimentary coffee and TV in our temperature controlled customer waiting lounge! Conveniently located on Old Middlefield Way in Mountain View off Hwy 101, Quik Smog is located around the corner from Starbucks, Subway and other restaurant making your experience that much more enjoyable and convenient.